"South Carolina's Sacred Spaces: The Journey Begins," so reads the front page of their March 2019 edition. 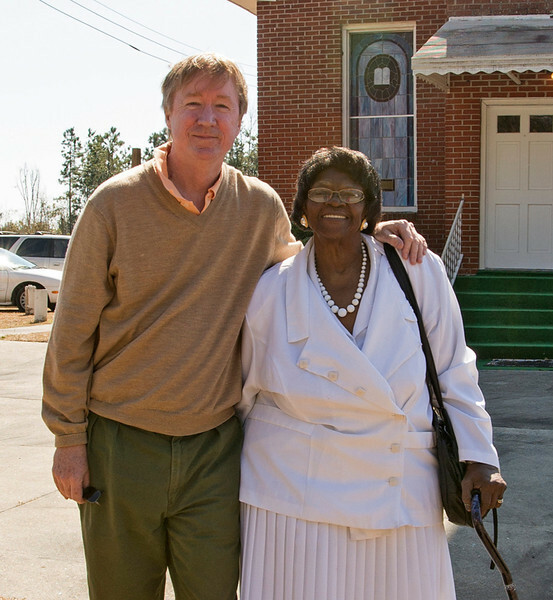 The photograph accompanying the story is Linda Reid, a black woman whose long ago history includes shared DNA, if you will, with one Captain James Frazier, the man responsible for building the incredible eight-sided plantation home in McCormick County's Cedar Spring Historic District. The story is one of twelve that will be shared with the newspaper's readers over the course of the next twelve months. If we can shove aside Linda's far more interesting story, my unlikely journey also began at the Frazier-Pressly House, now about eight years ago. A single photograph, I swear all I had in mind was to take a single photograph of that crazy eight-sided home that sits in the middle of, well, McCormick County. Thankful, and wish to use return in kind. I parked my car in front of this small building. The sign said it was a post office. Wasn't an active post office today. Friends of mine have walk in closets that are larger than this "could have been a tool shed" white clapboard building. I grab my camera gear, lock my car, and walk back across a deserted highway toward a distant historic landmark. Forgotten? 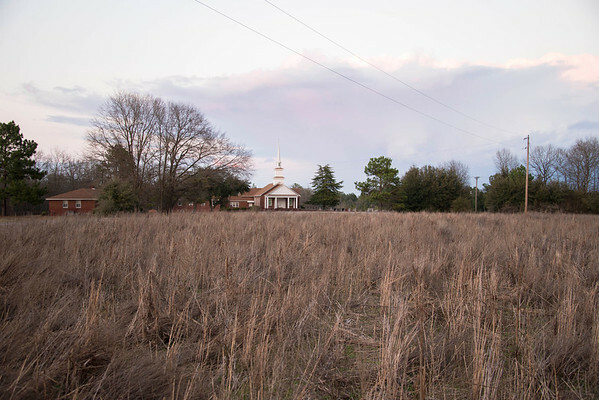 If you can judge how forgotten a landmark might be by acreage of kudzu, yes, the small Presbyterian Church would qualify. Carefully, I stepped through the vines, finally arriving at the structure. Key? No, I did not need a key. The door was off its hinges and resting against a outer wall. I walked inside, saw nothing but decay and ruin, took my photos, and left. That was back in 2012. On May 21, 2018, the Glenn Springs Preservation Society reopened what I had thought gone. Well done, team, oh so well done! Years ago, a Barnes & Noble community manager told me of the time a Pulitzer Prize winning author happened into a Charlotte store. Hey, I am just passing through the area, he said, and if you'd like, I will be glad to have an impromptu signing. Oh yes, Lynn said, we have plenty of your books available for sale, give me a few minutes to get this together. She did. And in that crowded store she made a public announcement, telling everyone a Pulitzer Prize winning author was ready to sign books. "How did it go?" I asked Lynn. "Not one book got sold. I was humiliated. By the author was so nice, told me these things happen all the time." But yesterday, Mike B. and I sold two dozen books, and I am so honored! 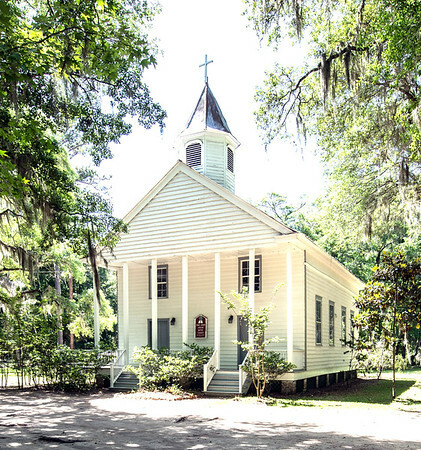 Years ago, I told my wife that these churches were so special, that I thought it surprising that no one has made a coffee table book on a few South Carolina favorites. With no expectations I have done so, and if yesterday is any indication, there is ample interest. Bless me followers for I have sinned. It has been nearly two friggin' years since I have updated my blog. Hey! I've been busy! 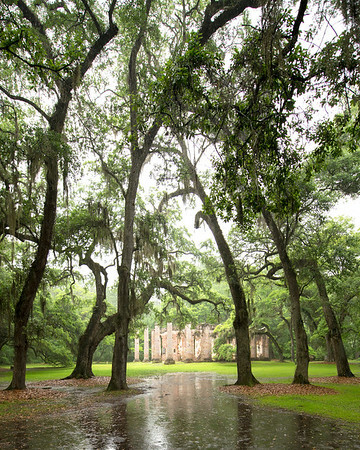 As noted elsewhere on this website, South Carolina's Sacred Spaces will be available in October, but it might be helpful if I review a few other items. A couple of years ago, I elected to make a coffee-table book of a few of my favorite churches and stories. Well, that looks beautiful, where can we buy a copy, so many people asked who looked at my personal copy. It is not available, it is just a personal copy I would reply. In truth, I did wonder: What should I do with this work? Forgive my lack of modesty, but the book is beautiful. Then, I happened to meet Mike Bedendaugh, the Managing Director of Preservation South Carolina. What do you want out of the book, he asked me, as he turned the pages. He, too was blown away. I personally want nothing, I replied, my only wish is that whatever profits come from the sale of this book are funneled back to preserving some of our state's at-risk churches and temples. Preservation South Carolina will print the book, help me market it, and then 100% of the profits will be directed to preservation. So what was I doing in Union? Mike and I had been invited to present our plans to the eight annual Upcountry Literary Festival in Union, South Carolina. May 1st, 2016: Hotter than a Taco! I know, you don't have to tell me. I've been ignoring my own friggin' website. But hear me out, I have a pretty good reason! In late 2015, I sent the folks at the National Trust for Historic Preservation a note, asking, by chance, if they might be interested in some of my stuff. They were. So there you have it. In the last five months I have posted close to a dozen or so posts about my favorite historic South Carolina churches. It has forced me to dig deeper into the histories of these places, and I have been the better for the experience. So, yes, I am still alive and hotter than a taco! Let it be known that from this month until the end of the year, I will faithfully be posting new and fresh material, here, at www.destinyunknown.smugmug.com. November 1st, 2015: Hey! Doubting Thomas! I'm Done! 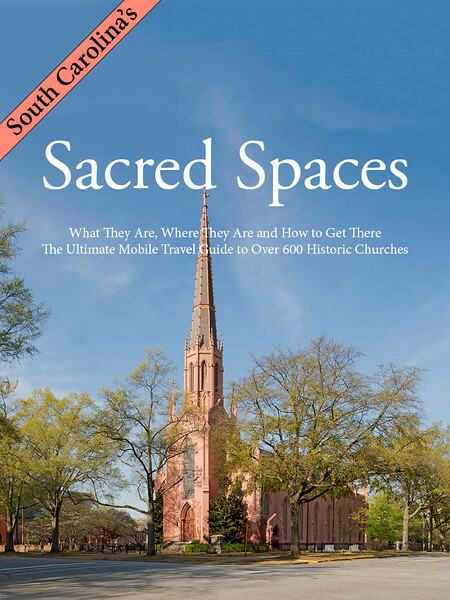 South Carolina's Sacred Spaces is now available on Amazon! How cool is that! God I love my field trips! To grab the camera and go, well, those times and hours were terrific. Never had a bad day in the field! So if you like South Carolina church histories, go to Amazon and buy my book. Thousands of miles and thousands of hours went into Sacred Spaces, all to say I hope I return to you a few hours of enjoyment. Oh, but wait, I am not done with South Carolina churches! In a week or two, I will share some more good news. August 23rd, 2015: Hey! What's that church! Well, this is depressing and interesting. Some of the folks are lying, simply want to talk about something more accessible such as football, but once I am on a topic, I cannot leave. I am glued to it. 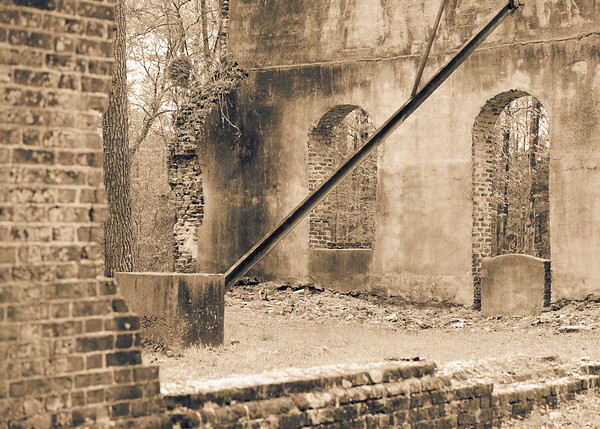 “The Old Stone Church, along with the nearby visitor sites of Pendleton Village, Fort Hill Plantation and Oconee Station, reflect the area’s transition from frontier to antebellum South Carolina society. The church’s early membership constituted a significant percentage of the frontier elite who dominated Pendleton District (now Anderson, Oconee and Pickens counties). Present-day Anderson and Pickens counties are named for individuals buried in the cemetery." August 1st, 2015: Pat Conroy, Daufuskie, and Done! I wouldn’t want to have to manage Pat Conroy; such were my thoughts after reading his book, The Water is Wide. The book, which I purchased at a small store on Daufuskie Island, recounts his experiences and tantrums when, as a young man in the late 1960s, attempted to change the world by teaching young black kids on a tiny island that time had forgotten. But there is most certainly an honored place at the table for the brash and courageous men and women who go against the grain to right injustices; all I’m saying that I wouldn’t want to have to manage Pat Conroy! That’s it! Done! Done! Done! Six hundred churches photographed and cataloged! Oh yes—the “finish line” to me was the First Union African Baptist Church on Daufuskie. My first visit to Horn's Creek Baptist Church in Edgefield was several years ago. The Garmin woman ordered me onto this dirt road, and I obeyed. I drove at least two miles, and then the road, what was initially suitable for 1.5 cars, narrowed. Then when I thought it could not get any narrower, it did. Deep ditches on either side meant "I need to call me a tow truck trouble." Then, I arrived not at the church, but at a locked gate. I said what I had to say, slid the car into revers, and drove back down that treacherous road. I returned to Edgefield, entered the other side of the same road, and after a mile or so, found the deserted church. The church was in sad shape. This historic gem, built around 1790, was near collapse. During a period of time, some local idiots even used it for satanic rituals. How sick can you get? 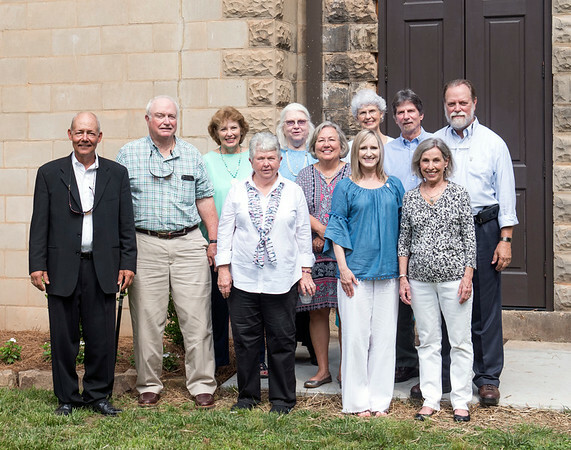 The Edgefield County Historical Society is now taking charge. They built a caretaker's home, hired a man to keep on eye on this place, and are now in the process of restoring the old church. It is going to take a while. So, I drive back to Edgefield one late afternoon to see the progress. The windows and door openings had protective coverings, that was good news. The best news of all was meeting the caretaker, Barney, and his dog, Beauregard. Terrific stuff! Barney is no "mere caretaker" but is an expert in the field of restoration. Spent seven years in Germany working on restoring some of that country's great cathedrals. He provided me some great details on this church, and the restoration plans. We wish them all the best on this terrific project. I did send a small donation as a way of thanking Barney for the tour, and to support their great initiative. If you feel so moved, send a donation to the Edgefield County Historical Society. Thanks to my mom and dad, I grew up believing I could do anything I wanted. Oh, to be sure, I discovered soon enough that I would never be able to swat the baseball like my hero Mickey Mantle, but it was only after I had tried that I came to that conclusion. Sure, give it a rip, my dad had said thoughtfully of my dreams to play centerfield for the New York Yankees, so I grabbed my ball and bat, believing it was possible. 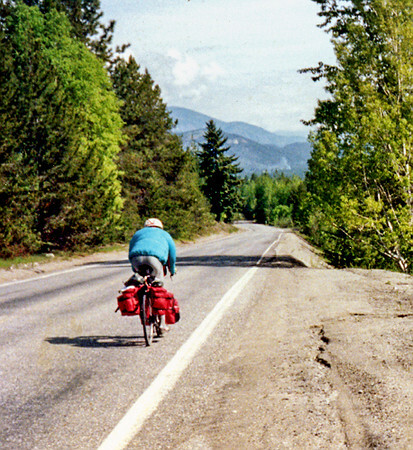 On May 22nd, 1993, my former college roommate and I fly from our South Carolina homes to Bellingham, Washington with a mind to bicycling across America. Dave was an advanced cyclist, I was not. In fact, I purchased the large framed black touring bicycle just months before we began our trip. It never occurred to me that I could not complete the 3500 mile long arduous journey, but I did. Upon my return, I decided to write a book about our experiences. Never had written much of anything before, but by now you know what I am going to say—it never occurred to me that I couldn’t. So I wrote the story about the people I met, like the three old women who met once a year for lunch in god-forsaken Hope Idaho, of the woman who returned to her childhood home in Harlem, Montana to “make a difference,” of the struggling small towns of the northern High Plains, the buoyant optimism of the Illinois farmland, and the sadness that is eastern Kentucky. Well, who would have thought? The book sold well, I appeared on television and radio, got to share the "goodness" of the American people. In just a few months, thanks to mom and dad, I will be finishing this phase of my journey among South Carolina’s historic churches. See, they never told me I could not write stories or take photographs, so I grew up thinking why, yes, I can do that. My dad passed away several years ago, my 95 year old mom, well, she tells me that she always knew I could do such things. Has it really been three months since I had something to say? Well, of course not! It's just that I have not had a minute to say it. Between the holidays, and "real work" I have not had a spare second, or so it seems. 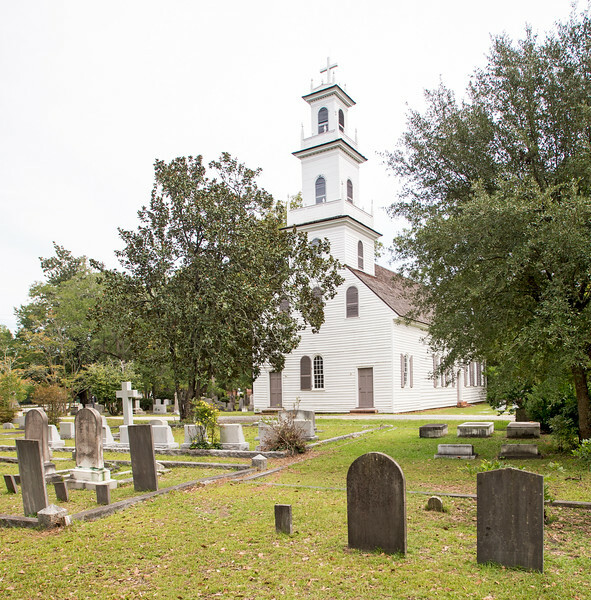 The present St. Andrews Episcopal Church building dates from 1764 and is cruciform in shape. The first church on site was built ca. 1708, enlarged in 1733, and burned in 1764 and probably rebuilt the same year. 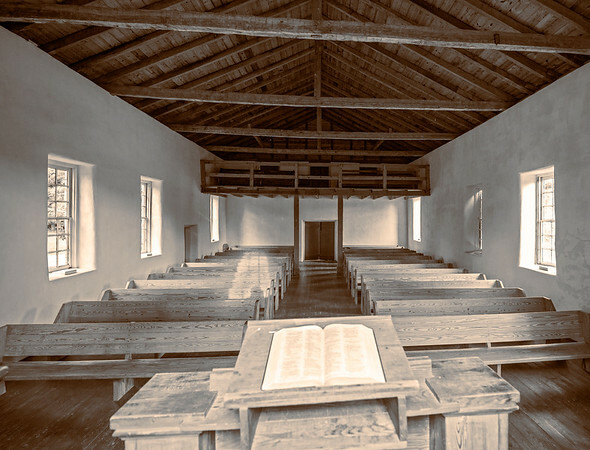 With passage of the Church Act in 1706 by the Colonial South Carolina Assembly, this church became one of the administrative centers of colonial government, serving as a place where proclamations and public notices were read and posted, vital statistics were recorded, poor relief was dispensed, and destitute orphans were apprenticed. The building maintains the architectural integrity of a rural colonial parish church of the 1760s. If Daufuskie Island was part of the mainland, I would be done with my photography! But alas, the two historic churches that are on that island are torturing me. Sure, I could pretend they don’t exist, as in say, “Here, my book is done,” and no one would question the omission, but in the same way that Monk, the obsessive compulsive person on the television show of the same name might spend all day in a sand trap smoothing out unraked sand, so I am with those two churches on Daufuskie. In the meantime, may I recommend a book? If you enjoy South Carolina history (church or general), I recommend the book I just read, “Against the Odds,” by Paul Porwoll. It details the history of St. Andrews Episcopal Church (Ashley River Road, Charleston), and it is one terrific story. It is available on Amazon. I believe it is of the oldest historic churches in the South. Along those lines, I am heading back to St. Andrews in about six weeks. They are having their annual Christmas event, and my wife and I have been invited. Cool! The new publication date for the Magnificent Historic Churches of South Carolina is now early December. What? Why the delay? Daufuskie! I gotta get to Daufuskie! It’s not like a trip to Myrtle Beach! PS-I made it to Daufuskie! Two weeks ago, I emailed "May I use your church history in my eBooks" queries to over 100 historic churches and a couple of dozen of the same kind of notes to other associated groups and organizations. Now, before I go any further, what do you think happened? What type of responses do you think I received? Ahem! This is all in good fun! OK, out of the 100 plus emails, I received about 40-50 responses--that is what I expected. 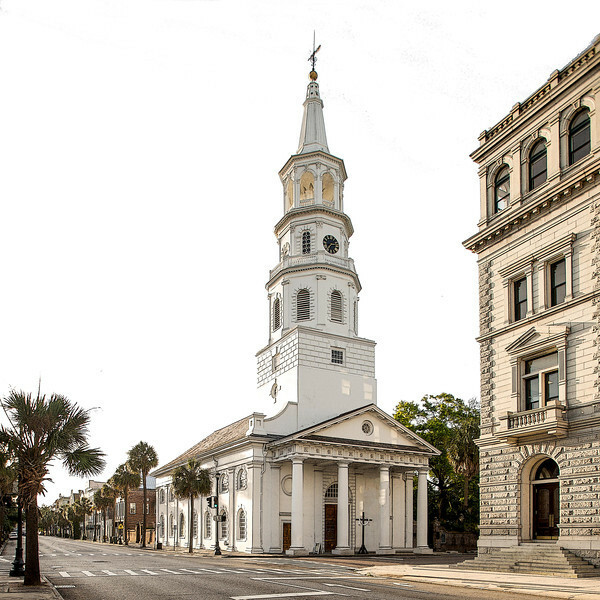 Without question, the most cooperative and supportive churches were those very historic in the Charleston area. The Presbyterian and black heritage churches were the least likely to respond. Of the few of the former that did, some of the ministers said, "Great, use it," other said, "Need to discuss this with the Session." In the end (thanks!) all said, "Go for it!" My friends in the Episcopal Church responded in a similar manner. Some of the minister said, "Use it," others said, "I need to take this up with the Vestry." In the end, again, all "came through." I will not mention the rural county whose Historical Society was so snippy and legalese as to cause me to eliminate their three paragraph summary from my eBook. Yikes! So instead of those three paragraphs (literally), I went to Wiki and cut and pasted a different summary. But, all in all, the churches and other groups have been so supportive, so many-many thanks to all! Yesterday, after visiting my mom in Pinehurst, I stopped in Cheraw, secured a key, and photographed inside the very historic St. David's Episcopal Church. 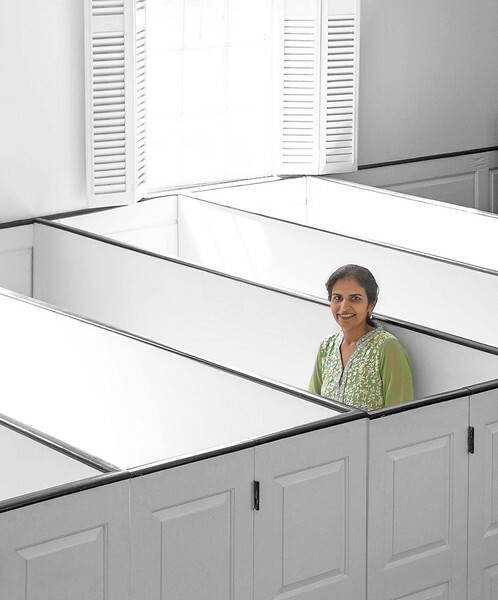 A co-worker, and friend, Poonam Jain, was with me--and was kind enough to pose for a few shots. The one, below, is my favorite. If you happened to see a tall red-headed man with a Nikon camera nearly running from church to church in downtown Charleston a couple of weeks ago, it could have been me. Hoping to take advantage of early morning light, I left the downtown Hampton Inn at 6:30 in the morning with a goal of photographing the 25 historic churches in Charleston’s downtown area. I could have driven, but the start/stop nature of that is tedious, so instead, I designed my own walking tour. It was exhausting, and terrific. Mission accomplished! After taking a shower and putting on proper clothes, I toured the historic Kahal Kadosh Beth Elohim Synagogue, the Jewish Synagogue. When the tour guide looked at me, she simply said, “You don’t look Jewish,” as a way of explaining to me why she singled me out to receive additional history on the Reformed movement. What a hoot! 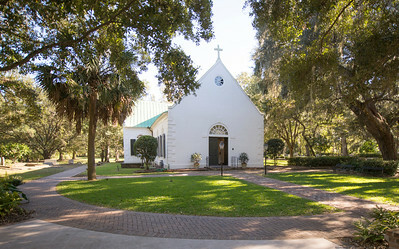 St. Michael's is one of a handful of Anglican churches with original structure still intact in South Carolina. When I lived in Charleston (back in the late 70s and early 80s), I used to walk downtown, but never really appreciated the city's history, until much later in life. Big Picture Update: I only have five more churches to photograph!!!!! So I wolf down the free breakfast at the Hampton Inn in Georgetown, and head out. It is 6:30 in the morning. After photographing zillions of historic landmarks, I know the deal, know I am in for one long day, know that hundreds of miles need to be traveled before I end up my day, not home in Greenville, but in Beaufort. In two days, my goal is to photograph all of these remote, God-forsaken churches. Oh, better put, God is still there, but the people have either left or stopped coming, that what I think when I see the lonely and empty buildings. Yesterday, when I photographed on my journey to the coast, I ate my two homemade ham and cheese sandwiches, and drank all of the waters I had packed in the cooler. In truth, on these two day trips, I look forward to treating myself when I travel, eating at McDonald's, drinking Coke and Pepsi. But is this to be believed? When I ended my day in Beaufort, I arrived hungry! I did not pass even one McDonald's in my journey across our rural landscape. Correct! Nearly 12 hours in the car, and 300 or 400 miles of dusty travel, and not even one, McDonald's. Yikes! But never mind my hunger woes, the churches were terrific! More on my favorite stops later, but I particularly liked my new photos of Sheldon Church. Upload Report: Sumter, Williamsburg, Georgetown, Horry, Dorchester, Orangeburg, Charleston, Beaufort, Calhoun, Barnwell and Aiken Counties!!!!!!!!!!!!!!!!!!!!!!!!!!!!!! Can't beat the name Taw Caw for a church, it's right up there with Pon Pon, such were my thoughts as I drove through the yellow pollen filled air of Clarendon County. As much I might have complained about the winter cold that gripped our state like original sin this past year, at least I could breathe deeply. I looked in the mirror, and frankly what I saw scared me-my eyes were so swollen it looked like either a) I was drinking all night, or b) I had sparred with a boxer. I did the count! 101 more churches to photograph! 515 are "in the can!" My target is to finish the photography portion of the trip by the end of May. Then, onto the history, making sense of what I have done. 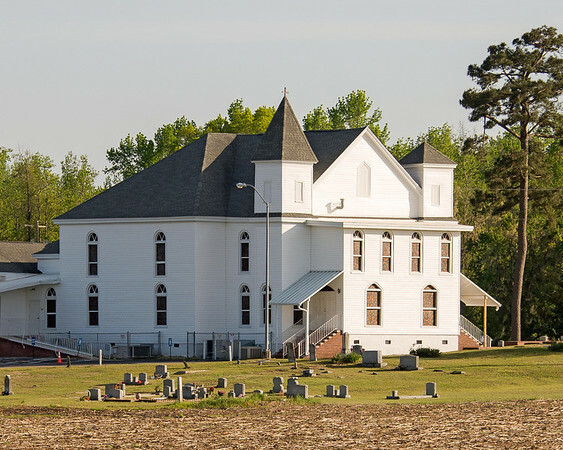 "The Taw Caw Baptist Church, located on Alex Harvin Highway, Summerton, South Carolina was organized and founded in 1858 as an offshoot of Calvary Baptist Church. The Honorable James H. Tindal donated the church lot. During the War Between the States, this building was occupied by Wheeler and his men. Due to bad weather conditions, the men attempted to put sand on the floor to build a fire. This caused substantial damage to the interior of the church. After the war, bankrupt conditions prevented the necessary repairs to the church Prior to this time, African Americans were still enslaved. They were not permitted to come together and worship as a body of people. We were told that the balcony of this church was used for the slaves to sit during the white man's church services because the white masters feared the slaves would run away from the plantation while they were in church. "After the Civil War and the freeing of the slaves, African Americans were given the opportunity to worship as they pleased, but they had no house of worship or church building. The freed slaves of this church held services under what was called a Bush Arbor. This continued until the year 1885. The white Baptist owners of this building offered to sell their burned out, severely damaged building which needed much repair to the African American Baptist. This building and land was purchased from the white Baptist on March 23, 1885 for four hundred dollars ($400.00). Many changes have been added to this building throughout the years; however, the main structure of the church still remains in tact. Originally, the front entrance faced Nelson Ferry Road with a road or lane leading up to the present entrance. Baptism was once held in the backyard of the church. Currently, Taw Caw Missionary Baptist Church serves a large congregation in the Summerton and surrounding areas. This congregation of Christian believers is under the pastoral ship of Rev. William T. Johnson. "In 1992, Taw Caw Baptist Church received its Historical Marker and is registered in the Historical Registry." New Uploads: Marlboro, Darlington, Lee, Sumter and Clarendon Counties! 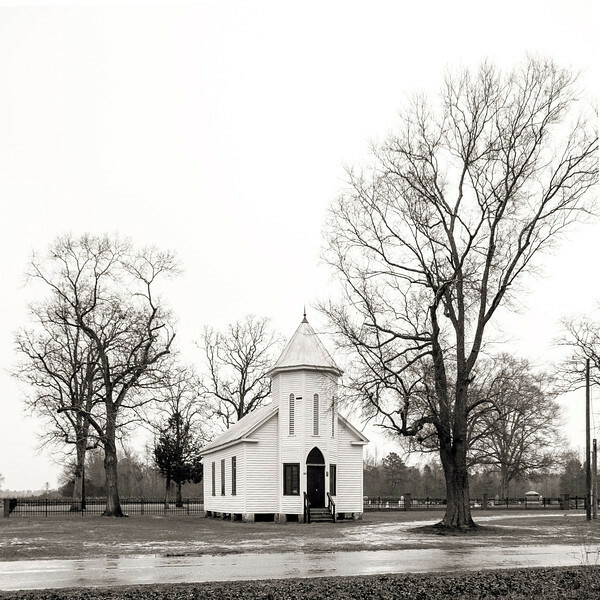 Photographing 630 historic churches in 46 counties means many often lonely miles. Sure, I have met some interesting folks along the way, and I have friends in our major cities, but when the goal is 630 churches, well, you have to keep moving. But now, with "just" 130 churches left to photograph, I have more leeway to stop and visit, and such is what happened this past week. I spent the night in Columbia, and had dinner with "sisters" Ann, Barbara and Jill, all friends from my USC days in the late 1970s. The following morning, I met fellow church history enthusiast Lynn Derrick for a cup of coffee. He and I "met" on my Facebook Church History page. 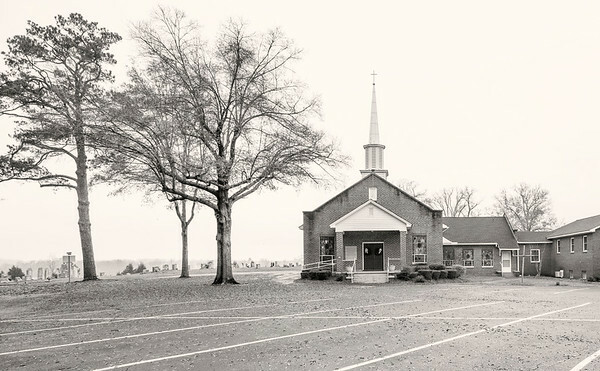 My "lonely mile" church of the week is of the Pleasant Hill Baptist Church in Kershaw County. It was an end of day photograph, and after taking it, I made the long drive back to Greenville. Dinner consisted of a McDonald's Quarter Pounder with cheese and a large hot bag of fries. Delicious! New Uploads: Calhoun, Fairfield, Lexington, Orangeburg, Richland and Union Counties! On a nasty and cold rainy morning, I work up at 4:45, left my Greenville home at 6:30, determined to photograph 42 historic churches Late in the afternoon, somewhere on a county road in Darlington County, I thought, no, I am going to fall a half a dozen short. Rats! Why did I feel compelled to take so many non-church photographs in Society Hill? Why did I spend so much time at the lesser stops, those churches with minimal history and minimal photographic interest? I was hungry, too. Lunch had consisted of a homemade ham sandwich, an orange, and a bottle of water...seven hours past. But I pressed on and holy moly, I was rewarded! The cold front passed through, leaving a wonderful nix of clouds and color! Terrific stuff! The photograph, below, is of Darlington County’s oldest Methodist church, Wesley Chapel, thought to be founded in 1789. By 1802, the church was known as Gully Meetinghouse and was located slightly north of this location. The present sanctuary built was built in 1908. New Uploads: York Lancaster, Darlington, Marlboro, Florence and Dillon Counties! I have enjoyed taking my winter photograph, all of the bare boned trees, clear air, and occasional ice and snow, but today, it is 75 degrees in Greenville, and that is such a pleasant change! No more snow! No more Arctic vortex! Pleasing colors, ahead! Last weekend, I managed to photograph a few churches in the lower part of the state, including the Mt. Zion Methodist Church in Florence County. I had been to the general area before in conjunction with my National Historic landmark photography project, so I knew as I approached the church that there was a nicely restored Rosenwald School on my left. For those of you who may not know, Julius Rosenwald, a Jew, was CEO of Sears Roebuck in the early 1900s. By chance, he met Booker T. Washington, and ended up (and this is really the Reader’s Digest version) helping fund and build over 6000 schools for the black kids in the South. There were over 500 built in South Carolina! His is an amazing and inspiring story. Uploads to Marion, Horry, Georgetown and Florence Counties are now available! Did I mention I am happy that spring has arrived? I woke up early, and before heading into work, uploaded a few from Berkeley County. Yesterday, even thought I didn't feel particularly well, I gave myself a pep talk, and made the two hour drive to historic Camden. Got there at 7:45! The early morning light was perfect! I then drifted over into Sumter County, only to encounter heavy rain showers. Oh great, I don't feel well, it's 35 degrees and raining. I said the "hell with it," and kept going. When I was young, my favorite television show was Kung Fu. In the series, the late David Carradine played the role of a Shilaon monk, traveling the western part of the US in foot, hoping to find his half-brother. For several years, it was one of the most talked about series in the US. In one episode, he came across a man struggling to clear some land. Without a word, David pitched in, helped the man remove a stump, and under the stump were a few wild onions. So yesterday, in the cold rain, I too was rewarded! In this case, the historic Richland Presbyterian Church looks good in color and black and white. We all know the old saying--when it is clear don't shoot, when it is cloudy do--hence, no updates for mid-January. Then, I got a nasty cold, fell into ill humor. Then, it snowed. Cripes! So, in the interim, I have been reading quite a few interesting books on the history, including one called, "The Dawn of Religious Freedom in South Carolina." I wondered, over the years, why we had/have such a vibrant Jewish community in Charleston, or why/how Catholics were able to achieve such a religions stronghold in this mostly Protestant area. Turns out, the British were so in need of people to settle the Carolina territory, that they allowed much more freedom of religion in the original charter of the Carolinas, than we would assume. In fact, it only took seven members to form a legitimate church! Hence the different faiths, including the Jews, Quakers, and Huguenots found the Carolina areas, at least comparatively better. Such were my thoughts when the Garmin ordered me to turn right onto this narrow one-lane dirt road. Then, just when it seemed like the road could not get narrower, it did. Then the road just ended and all the Garmin woman is acting like I should plow ahead like I am driving a tractor, which is exactly what I would have to do, for I am staring at a farmer's field. 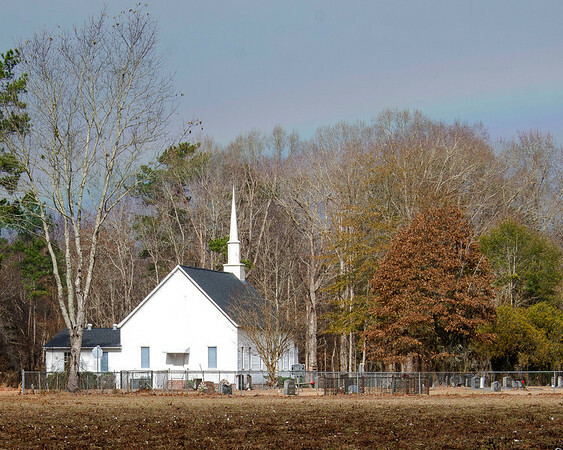 I reversed course, knowing that I would have to make a second attempt to find the Beech Branch Church in very remote Allendale County, a misstep that will cost me valuable hours. That evening, at the Olive Garden in Beaufort, I used my laptop and Google Earth to find the church-again-but this time, as opposed to jotting down just the GPS coordinates on a pad of paper I sketched the nearby roads and landmarks. Sigh, it's so remote! Maybe I should "cut and paste" a photo from the internet? I did not really want to make this long, return trip for a single landmark. But in the end, I decided I needed to take a leap of faith that I could find the landmark....and I was rewarded. The church itself, organized in 1759, became known as Beech Branch in 1822. I know, I know, the photograph is of the rear of the church. But I could not resist the rainbow! Then, too, this angle allowed me to capture the church's very rural setting. How beautiful it would be to photograph this church when the cotton is in full bloom. Upload galore! Aiken, Bamberg, Beaufort, Colleton, Hampton and Jasper counties! I attended the University of South Carolina from 1972-1978. During my college days, Mom and Dad lived in Raleigh. If I couldn't catch a ride, home for the holidays, I'd have to take the Greyhound bus. It was so bad! Patrick, McBee and Bethune...those places seemed hopeless, even then. But for some reason, I always felt better when we got to Cheraw, maybe because the bus station was big enough to have a snack bar. Every one else on the bus had a brown bag lunch, but I didn't, so to me, Cheraw was an important stop. 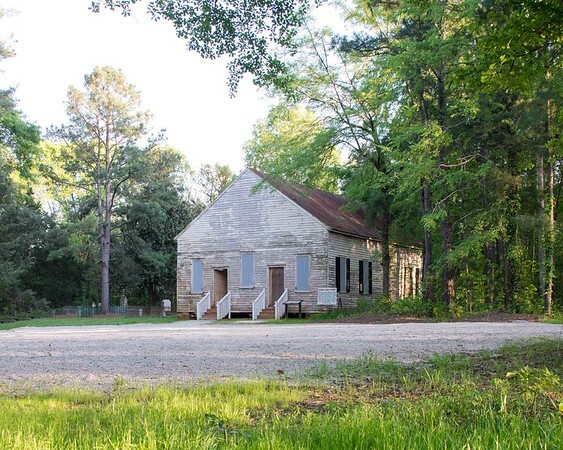 "One of the states’ few remaining pre-Revolutionary War church buildings, Saint David’s Parish was established by act of General Assembly 1768 and named for the patron saint of Wales, from which many Cheraw settlers had come. The building was used as a hospital during both the American Revolution and Civil War." Now how cool is that! One of my photographs of St. David's Episcopal is below. Oh yes, I peeked! Until now, I have resisted the temptation to "do the count" of how many churches I have visited and how many more remain. Well, I poured a glass and figured out that I have completed 275 and "only" have 354 to go! In the last three years I have become very accustomed to South Carolina hospitality. Maybe too accustomed, which is why I found it so surprising that at an unnamed Lexington County church, a man all but demanded my business card before allowing me to leave the premises. On a Saturday afternoon, I see sign of life inside this large church, so I walk inside, introduce myself, and ask permission to photograph the historic sanctuary. He said yes, but it was clear he didn't really mean yes. So I chatted it up, hoping he would warm up, but he didn't. He asked for my business card, but I did not have one in my wallet. "Probably have one in the car," I offered, so he followed me outside, walked to my car, and waited in the misty rain until I could produce one. I did, thanked him kindly for his hospitality--I was triple nice--and drove away. Earlier in the day, by way of contrast, a woman, who was all by herself inside the Butler Methodist Church, when she saw me taking outside photographs, invited me inside and gave me a fine tour. So, that fine church is featured, below! Earlier this week, I photographed the last of my historic churches in Fairfield County. The area has some beautiful rural churches. I managed to photograph a few churches in Richland County, one of which, Cedar Springs Methodist Church, with its organizing date of 1743, really caught my eye. Turns out that the famous minister, Francis Asbury, figures into its history. In 1791, Asbury was traveling to Richmond from Charleston. He spent the night at the home of a local landowner, and given a jug of wine the following morning. 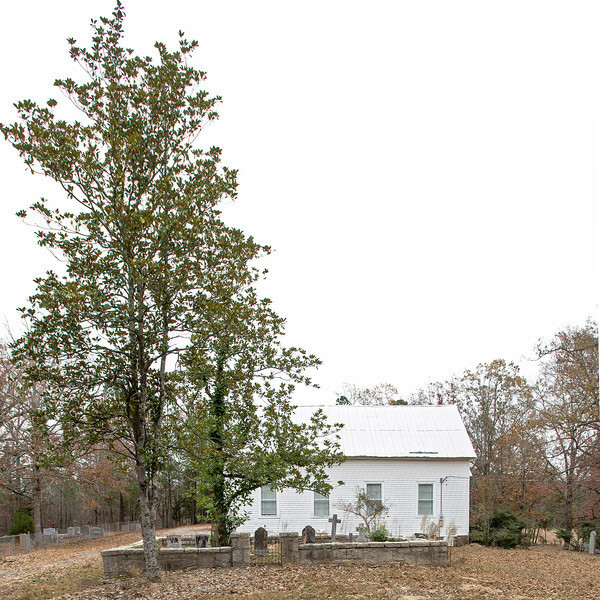 His traveled to the “Cedar Creek Meeting House,” as the church was then known. Um, “invigorated” with the wine, Asbury “preached with such vigor and conviction that he converted the entire congregation from the Presbyterian faith to Methodism,” according to the 1982 book, North of the Broad River: The Land and Its People. To the left of the highway, fancy subdivisions, fancy people, fancy cars. To the right of the dam and Lake Keowee, lies the forgotten and downtrodden town of Newry. There is nothing fancy about Newry. The abandoned textile mill is foreboding and overgrown, and is an absolute eyesore. Last year, I jumped the fence and photographed the ruins, this time, no. Much of the town is classified as an Historic District due to its textile mill heritage, including two churches, both of which have now been converted to private housing. 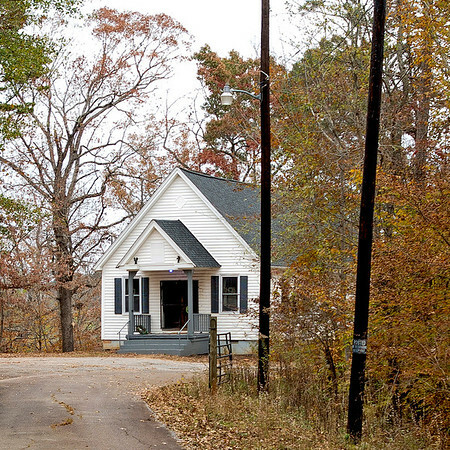 The photo that follows is of the Emmanuel Holiness Church. Today, it appears to be a (nicely maintained) private home. I have just uploaded do-over week, Part 1, for Anderson and Oconee counties. Tomorrow, I hope to complete Part 2, which is a return to that lovely string of churches in Fairfield County. 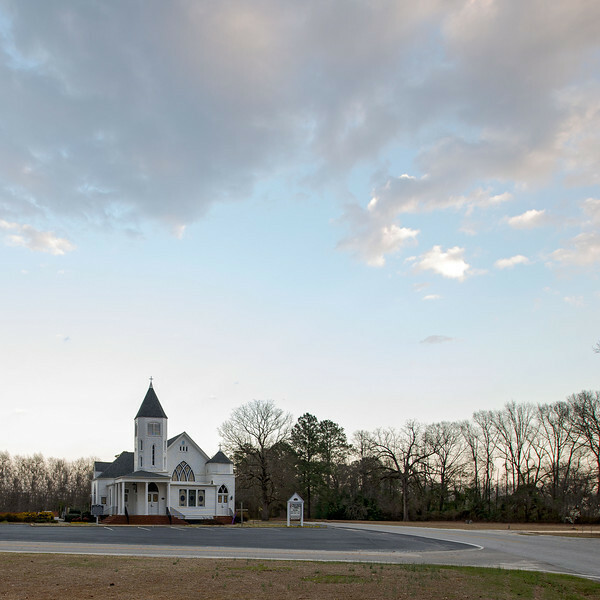 From a big picture perspective, I have just about completed photographing the churches located between I-85, I-26 and I-20. Clouds, for the love of God, where are the clouds? Direct sunlight is what I got instead, and direct sunlight is the mortal enemy of photographer. I drove to Fairfield County anyway, hoping that a band of clouds might allow me to capture that county's stunning collection of churches in all their brilliant colors. But maybe the leaves will hang on another week or two, and I can give it another go. I am eager to get to Mt. Carmel to photograph a couple of historic churches when I slow down but don't stop, at least immediately, because there is no traffic light in Willington. I see this mostly empty "city block," and out of the corner of my eye, a South Carolina Heritage sign. Robert Frost once wrote and I am paraphrasing, "When a friend calls out, you drop your rake to visit." Such is how I felt about this unusual sign in this otherwise forgotten town. I brake, reverse, park and enter. How delightful! I spend a wonderful time in the town's library and museum, meet a couple of local volunteers and learn much about the area. I know, I know, nobody aside from history or photography buffs may actually decide to travel to places such as Willington or Mt. Carmel, but today, I did, and I am glad, to again borrow from Mr. Frost, it has made all the difference. I could not wait for the leave to turn. I wanted to hit the road, so...I just posted a number of new church photographs in Anderson, Oconee and Pickens counties. I will be busy next week "on the road." Next postings in a couple of weeks! I sat in my car, wondering if I really needed to make yet another trip to St. Paul's Church in Pendleton, for I had been there before and was satisfied with the photos. After a busy morning of photographing churches in Anderson, Pickens and Oconee Counties I really wanted a spicy chicken sandwich and salty fries from Chic-fil-A. But I went, anyway. I didn't really want to, but I did. When I arrived, the church doors were open. Eureka! When I wandered inside, I met several people, one of whom, Dr. Timothy Stewart, was playing the church's Jardine organ. It's an 1800s classic and Dr. Stewart had driven from Atlanta to play it. 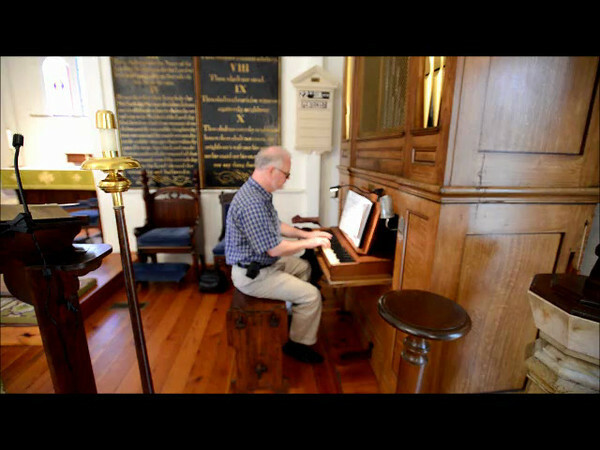 I will have more on the Jardine organ in the future. PS-Sigh. I am not at all used to using my nice Nikon camera for video purposes, so, um, don't adjust your monitors! It was "my bad" on the focus. No doubt about it. October 20th, 2013: Car and Camera...Ready! It was in early July when I decided to make a run at photographing the historic churches of South Carolina. Since that time, I have been glued, oh, let's say stitched to this computer, getting ready to hit the road. To be sure I've gotten a lot done...I made the first draft of "the list," converted all the addresses into coordinate form, organized my Adobe programs for what is to come, and waited. And waited. No sense starting a trip in September when the leaves are still green and a month away from full color, so is my reckoning. In a week or so they will start to turn in the Upstate, so when they do, I will hit the road, and I can't wait.